Review the instructions for Part II and Part III and determine which one you will complete. Organizations can complete either Part II or Part III each year if one provides a higher public percentage. Carefully monitor substantial contributors and the impact on public support percentage. Significant gifts (those in excess of 2 percent of total support) must be backed out of total public support and can cause an unexpected drop in your public support percentage that could be a red flag to regulators. Consider whether any large amounts qualify as unusual grants, if applicable. Unusual grants are: substantial contributions from a disinterested party; given because the recipient is a publicly supported organization; for an unusual or unexpected amount; and would result in the organization not meeting the public support test if the unusual grant were included in the calculation of public support. Ensure that you have accounted for donor-advised funds appropriately. Amounts received from donor-advised funds qualify as public support even if the underlying individuals would otherwise be disqualified persons. Verify that everything from Part VIII is properly reflected, or excluded, from Schedule A. Remember that names and addresses of your contributors can (and should) be redacted on your public inspection copy of the return. Double check your donor-advised funds reporting. Contributions from donor-advised funds should be treated as coming from the sponsoring organization, not the underlying individuals. Refer back to Schedule A, Part II to determine whether you meet the public support test. If you do—regardless of the primary category of exemption—your organization qualifies for the “special rule” to only include those donors who contribute more than 2 percent of Part VIII line 1h on Schedule B. Check on your lobbying expenses and activities. If a “substantial part” of a 501(c)(3) organization’s activities involve efforts to influence legislation, it is at risk for losing its tax-exempt status. Be familiar with the definitions of lobbying and what activities are permitted. Some organizations opt to elect the expenditure test under §501(h) as an alternative method for measuring lobbying activity. If your organization is organized under 501(c)(4), (5), or (6) (i.e., it is a qualifying not-for-profit civic league, social welfare organization, employee association, labor organization, or business league) lobbying is permitted. If expenses exceed $2,000, organizations must pay a proxy tax or inform members that a percentage of their dues is non-deductible. Spend some time with your Schedule D. It is often helpful for board members and management to review because it highlights the reconciling items between the financial statements and tax return. If there are significant amounts of alternative investments (futures, commodities, hedge funds, derivatives, etc. ), there may be unrelated business income (UBI). Too much UBI can jeopardize your tax-exempt status and leave you with a tax bill. Foreign activity, particularly activity involving foreign bank accounts, is of significant interest to the IRS. If your not-for-profit organization engages in foreign activity or it or its employees have signature authority over foreign bank accounts, you may be required to file Form 114 (FBAR). Penalties for missing these filings start at $10,000. IRS exemption does not necessarily apply in foreign jurisdictions. Offices, employees or activities abroad can result in income, value-added tax (VAT), or other unexpected taxes. Maintain proper documentation of all fundraising activities to allow for the separation of the contribution portion of the revenue. This is equal to the excess of the money given over the fair market value of any goods and services received by the donor. Development personnel and others reviewing your Form 990 are sometimes confused by apparent “losses” from fundraising events showing up on Schedule G. However, adding in the contribution piece shows a more complete picture. Do not include salaries or other compensation paid to employees or independent contractors. Grants to affiliated disregarded entities should also not be listed. Assistance to individuals paid through another organization should be included in Part II rather than Part III, unless the grants are earmarked for specific individuals. Be ready to explain the compensation levels for your top executive staff, and completely disclose all types of compensation, including deferred compensation, severance benefits, fringe benefits, and compensation from related organizations where applicable. Officer compensation levels are very important to the public and watchdog groups who may perceive that too much is going to salary instead of programs. Also be prepared to explain the use of any incentive compensation arrangements, which are often looked at unfavorably by donors. Regardless of whether your organization follows a fiscal year end reporting schedule, the Schedule J is based on calendar year numbers. Reported W-2 compensation should equal the sum of column (B) (i), (ii) and (iii). Columns (C) and (D) should equal Part VII, column (F). Be sure that if your organization has any outstanding liabilities associated with tax-exempt bond issues, that you have complete and accurate reporting, especially around use of bond proceeds, private business use and arbitrage compliance. Discuss your Schedule K responses with bond counsel or tax counsel before filing. Be advised that there are four parts of Schedule L aimed at different transactions with interested persons: Part I – excess benefit transactions, Part II – loans to/from interested persons, Part III – grants or assistance to interested persons and Part IV – business transactions with interested persons. Only Part IV has a monetary threshold. Double check that your excess benefit transactions are divvied up in the proper tier. Excess benefit transactions for the first tier include anyone having substantial influence, second tier includes family members of the first tier plus entities controlled 35 percent by the first tier. Dates matter with excess benefit transactions; they include those with any party considered a disqualified person in the prior five years before the date of the transaction. Note that a board member reported on Schedule L of the organization or a related organization is not independent. If an individual is included on Schedule L as a result of being a substantial contributor, his or her name does not need to be included. Such individuals should only be listed as “substantial contributor” or “related to substantial contributor” to protect his or her identity from public disclosure. The schedule is only required if non-cash contributions exceed $25,000. Items on Schedule M should also be included on Schedule B if reporting thresholds are met. Pay particular attention to the valuation on non-cash items because the IRS is beginning to focus more of its attention on non-cash goods. Ensure you have a gift acceptance policy to manage the expectation of donors and prevent gifts of items that run counter to your values or are difficult to sell, dispose of or manage. The form is usually only filed once in conjunction with an organization’s final Form 990 to detail the final distribution of assets upon ceasing of operations. Just because the Schedule O is near the back doesn’t mean it’s not important. This is your place to shine. Use it as a marketing piece for your vision, mission and accomplishments. Provide further explanations on issues that may be of concern to readers, such as compensation practices. Highlight governance with details on 990 review, conflict of interest and other policies, compensation practices and public disclosure of documents. Communicate any significant changes to your exempt purpose or activities. The purpose of the schedule is to highlight related organizations, transactions with related organizations, and identify unrelated partnerships through which the organization conducts significant activities. All activity of any disregarded entities owned by the organization should be included on Form 990, not just the net income. Be sure to disclose related organizations including, parent/subsidiary, brother/sister, supporting/supported, sponsoring organization/contributing employer of a voluntary employees' beneficiary association (VEBA). For control of non-stock not-for-profits, look at who has the right to appoint or remove board members. Also look to overlap of the majority of officers, directors, or employees. In many cases, the supplemental schedules to your Form 990 filing convey the information that your board, charity watchdogs, and the public want to know the most. Take the time to verify that your supplemental schedules are complete and accurate before you file to make sure you are putting your organization in the best light. 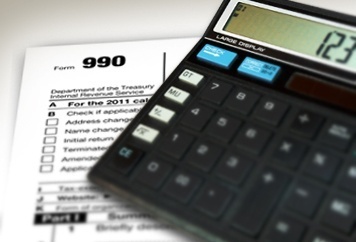 For more information about Form 990 reporting, please contact us.